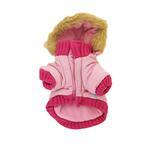 The Pocket Dog Parka by Dogo - Pink is a fashionable and functional dog jacket for the wintry weather! 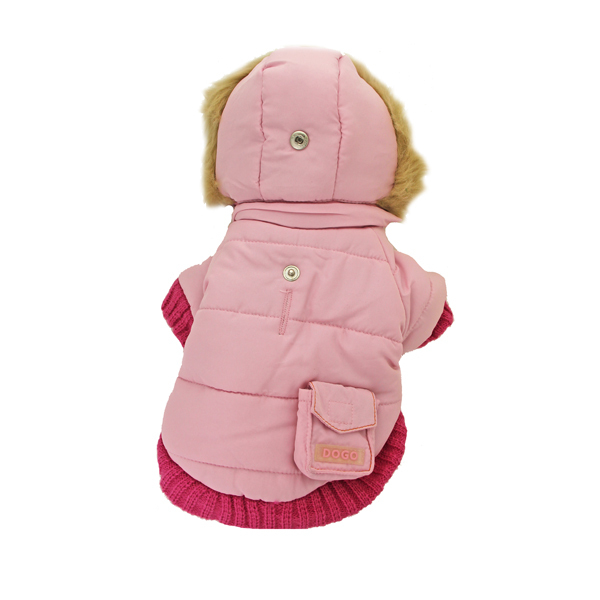 The cute Pocket Dog Parka by Dogo - Pink will keep your four-legged friend comfy in the coldest of conditions! 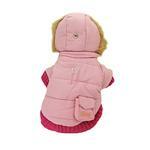 This dog coat features a removable hood and pocket on back, great for waste bags, treats or ID. The touch fastener closure makes for easy on/off and the leash hole on back adds convenience to your next adventure. Its fleece lining will keep your dog warm in the harsh elements. Made of 100% polyester. Pocket Dog Parka by Dogo - Pink Customer Photos - Send us your photo! Chloe and her brother are ready to brave the frigid temps in their Dogo parkas! Chloe feels like the kid in the Christmas story! Can't put my arms down! Warm and toasty in this coat from Baxter Boo! Little Miss Chloe "In the Hood"
Our Little Fiona loves her new coat from Baxterboo... Keeping her nice and warm. Posted On 12/31/17 by christy b from New York, NY Yes, christy b recommends this product! Beautifully made jacket just like a human one, but it is VERY BULKY with the fleece in the seams. It is much too restricting on my 7lb Malteses who have short legs which makes the sleeves too cumbersome. Posted On 07/13/16 by Onesa B from Brooklyn, NY Yes, Onesa B recommends this product! This is a very warm winter coat. Runs true to size. Posted On 01/19/15 by Rhonda C from wise, VA Yes, Rhonda C recommends this product! This coat is so pretty..it fits great ..love the fur around the hat and the pretty pink color ..it's the perfect winter coat! Posted On 01/05/15 by Sandi P from Pottstown, PA Yes, Sandi P recommends this product! From the minute that I saw this Parka, I knew my "little girl" Cybele, a Chihuahua mix, would look so cute in it. The Parka is very well made and does keep her very warm. And the size that I bought fits her perfectly. Cybie loves it. Thanks BaxterBoo .